Discover how you can get into the sport of Laser sailing, as we walk you through a step-by-step guide to getting you onto the water fast. Even if you have NO experience whatsoever, we break it down so that you can learn many of the sailing basics, as well as tips and techniques that the expert sailors use. This means you can get the most out of your Laser Sailing Dinghy faster! It’s time to stop contemplating. There has never been a better time to discover the simple steps to get you out on the water. Without some of the tips here, you may end up spending more of your hard-earned money, or your precious time, than you should! However, if you are serious about getting into the sport of Laser sailing, I have some great news for you. to find the best ways to get up to speed in this great sport. Here’s the good news… it doesn’t have to be like that for you! Here at Laser Sailing Tips, we share many of the tips that beginners can use immediately to start the journey into Laser sailing. Even if you are not a beginner, or if you sail other types of dinghies or even yachts, I am sure that you will be able to pick up some useful tips. One of the great things about sailing is that there is always more to learn. Whether you are learning the basics of sailing or are at a more advanced level, learning from others is one of the best ways to speed up your knowledge. Even if you have no prior knowledge, we are here to help. And the best part is that this information is available to you FREE!! So read on, and in no time you will be experiencing what 1000’s of others are experiencing… the enjoyment of sailing a Laser. ps. I’d love your feedback and ideas on what you would like to see on this site. If you have any laser sailing tips of your own that you would like us to include, please feel free to contact us and tell us about them. We will, as you would expect, acknowledge your contribution. Thanks for visiting Laser Sailing Tips. Glad that you’ve found the site useful. I don’t think that the shortening of the centreboard a little would cause the weather helm that you mention. Sounds like you are just overpowered. As the wind increases, if you start heeling more, this will naturally tend to point the boat up into the breeze, causing the weather helm. Try flattening out the boat more using the cunningham, outhaul and vang. Hike out hard. This should help keep the boat flatter, reducing the weather helm, and increasing speed. As for the correct length of the centreboard, you may want to check out the current rules. Great site. A Really nice read. I’ve a quick question, I found myself in an uncomfortable situation not long ago. I was around 1 mile off shore practicing beats when the tide turned and the wind dropped to nothing (literally nothing). I couldn’t move the boat at all and gently bobbed with the tide drifting out to sea! Fortunately the wind rolled in and I was able to sail back but I spent a good 20mins I panicking! If I’m close to the shore I usually paddle the boat back. Do you know of any techniques to somehow get back in when you’re quite far out (as paddling 1 mile is likely beyond me)? Not a good spot to be in! I thankfully haven’t been out when there is absolutely no wind. Other than paddling I’m not sure what you can do. You can try moving the rudder from side to side which will push the boat forward – not ideal for large distances and probably doesn’t do your gear much good. Other than that, keep an eye out for any puffs of wind on the water that you may be able to use to your advantage, as well as any approaching motor boats and ask for a tow. Maybe some of the other readers have some suggestions?? Let us know if you discover anything more useful. Have you thought of strapping a kayak paddle (which can be broken in two) to the mast and using it for paddling home? Also, if the current is not too strong you can make some progress (I suspect about an mile an hour) by standing on the bow an gunnel bobbing – rocking back and forth. This takes a bit of practice but it is effective. I always carry a cell phone on board for emergencies. Excuse my English but I use google trasnlate. Takes some balance but take the main sheet in your hand and stand in front of the mast. Rock the boat side to side as much as you are comfortable. More the better. This should get you going a couple of knots once you get comfortable. Thanks Andrew. Sounds like it’s worth a try. Thankfully I’ve never been in that situation, but will give it a go if / when caught out next time. Huge amount of info for one who wants to learn a bit about the boat before buying one. I’ll be back to learn more! Thanks for visiting my site and for your question. You definitely don’t need a turbo kit when you are just starting out. They are quite expensive, so if you are just testing to see whether you will continue with the sport, you can (as you have done) buy a boat without the turbo kit, and always upgrade at a later date. By installing the new blocks, cleats and control lines in the kit, it provides more purchase and easier access to the lines, making adjustment of the vang, cunningham and outhaul easier. This allows more precise tuning, which may give you the competitive edge. Hope this helps. Good luck with your laser sailing journey. Hi, what is the max speed of a laser? and how easy is it to get it there? Thanks Garfield, I’m happy that that you found it useful. Wow, that’s what I was exploring for, thanks admin of this website. My query concerns the launching trolley for a Laser Pico – very similar, I think, to the standard Laser trolley. The trolley is designed to support the boat by the gunwales rather than the keel as in trollies for most other types of dinghy. The problem is that the supports have separated so that they are wider apart that the gunwales and if one side is supported, the other support is outside the gunwale. There is no adjustment as it is all welded together. The trolley is otherwise in good condition. Does anyone have any suggestions as to how the supports can be drawn in by about 2-3 inches? It’s a bit of an unusual problem. Not sure how this could happen. Presuming that the trolley did actually fit the dinghy at some stage, it must have been bent out of shape. Maybe a welder or a fitter and turner could bend it and / or re-weld it so that it would be at the the correct width again for your boat. Not sure if some other readers have seen / experienced this before, and can offer some advice. I just bought 1988 dingy laser. First time sailing in open water I only flipped it 3 times. It rights up well. I weigh 230. Anyway , I paid 1500.00 for laser dingy 4 sails two masts all rigging and dolly… Is this a good deal.? That’s a bit like saying “How long is a piece of string”. For me, it really depends on the condition. If it’s in great condition, with no soft spots in the hull, the spars, sails, foils and ropes are all good, then $1500 is probably pretty good. But if it’s at the other end of the spectrum, and it’s seen much better days, then it may not be such a good deal. There’s a fairly wide range in prices on the market, and a fairly wide range of condition with boats on offer… hence why I put this guide together. Anyway, hope that helps a little. do you or any of your readers have experience using a turbo sail on their laser. It is claimed to have 125 ft2 so it is a considerably bigger sail than the standard 76. My question or concern is since I own a laser from the 80’s, can the mast stem, mast, and rigging withstand the added stresses and forces from the larger sail. I love the thought of the additional speed especially with a crew of two but concerned about damage. I don’t have any experience with the turbo sail. I know that you can have issues with the mast step, so if there’s any extra forces in this area, it may lead to some problems. There’s an interesting discussion here, if you want some further reading. Maybe some of the other readers can help out. I am 15 and a keen dinghy sailor having grown up into the business. Last year I began single handing in a topaz, sometimes using an asymmetric spinnaker by converting into a topaz race X. I also love to crew: fireball, merlin, cadet, mirror you name it! 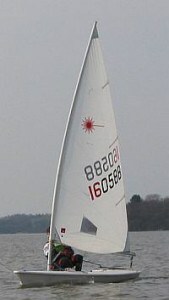 I am looking at moving out of the topaz and into a laser radial but will only have money from selling my topaz to buy a laser. a) is it a good idea to move into a laser? If not do you have any suggestions of single handers? It’s great to see that you are so keen. Regarding your questions, in my opinion it depends on what you are after. Lasers are very popular, and because they are one-design you can generally find plenty of clubs around where there is quality racing each week. They can be raced right through from beginners up to advanced, so can cater for all abilities. They are not the fastest boat out on the water, but I think it’s the closeness of the racing that attracts so many people to them. Considering how old your topaz is, it should still get a decent price. You won’t be able to get a new laser for the same amount, but you should be able to get something pretty reasonable. There are generally plenty on offer, so just keep your eye out and let people know that you are looking for one, so they can keep an eye out too. By the sounds of it, you should have plenty of contacts at the clubs, so why not ask to take someone’s out for a spin one day so you can judge it for yourself. Also have a look around and see if there is anything else that catches your attention and maybe try them out too so that you can compare. Hey, I’m 16 and I weigh 215lbs, would I be competitive, if I were to get Into laser racing? Or is that to heavy to be competitive? Yeah, 215 lbs is a bit heavy than most sailing the laser, so especially in the lighter breeze, you might struggle to keep up. If it’s generally quite breezy where you live, it might make it a bit easier for you though. Check out this thread for some more info… click here. I just sailed my used laser for the first time. I noticed that I got a bit of water in the boat (not in the cockpit, but in the hull). I took the drain plug out in the stern of the boat and it drained out. What would cause this? Water getting into the hull would most probably be from cracks. This can happen in a few ways. When your deck and hull gets soft, there can be tiny cracks that can allow water to penetrate. You can also get cracks in and around the mast step, fin case, plus where the deck and hull join together. So when you are buying your laser, always check out the stiffness of the deck. Also, a sign that there may have been repairs in the past is an inspection port. If the repair job was a bit dodgy, the inspection port or the repair job itself may leak a bit. And if you are keen and got some time up your sleeve, you can fill up the mast step and see if the water level drops. This may indicate a leak. Hi, This is such a useful site! I was just wondering if there is anything in the laser class rules against painting your boat a different colour than “laser grey”. I have noticed that you see almost no lasers in different colours apart from laser grey. I thought it would be pretty cool to have a laser that has a unique colour but I thought I would just check here in case. Thanks again for the amazing site. Thanks for that… I really appreciate your comments. From what I understand, as long as you don’t make the hull lighter in weight to improve its performance, you should probably be ok.
That being said, if you paint it, it will probably add to the weight, so (other than looking cool) it may have a negative effect. There is a bit of a discussion here, so make sure you check it out. I just got a 1976 Laser and I’m sure its a little soft and prob had repairs but for a couple of bucks it might help me learn to sail. I have had it out three time and I made it back to the dock all three times. It has also captsized and it rights up pretty easy. I was looking at parts as I need a new hiking strap and saw that plastic bottles for air are sold as a replacement for styrofoam. Looking through the inspection port I do not see anything to aid in floatation. Do I need these bottles? Will the boat sink without them? Thanks for your help. No, you shouldn’t need any styrofoam, as the hull should be watertight, meaning that it won’t sink. It’s fairly common for older lasers to take on a bit of water, as they can form small cracks that can let a small amount of water in, but if it’s letting in enough water that you are worried about it sinking, then you might want to investigate further and get the leaks fixed. It might have more substantial cracks around the fin case or mast step. im an italian just land in sydney. i would like to have sometimes a nice sails on a laser. do you know someone who hire them? Otherwise just wander down to the local clubs and ask around. Some of the locals may know of somewhere that can help out. If anyone knows of anywhere that rents Lasers, please leave details below. Enjoy your time in Sydney, and I hope that you have a great time out on the harbour.